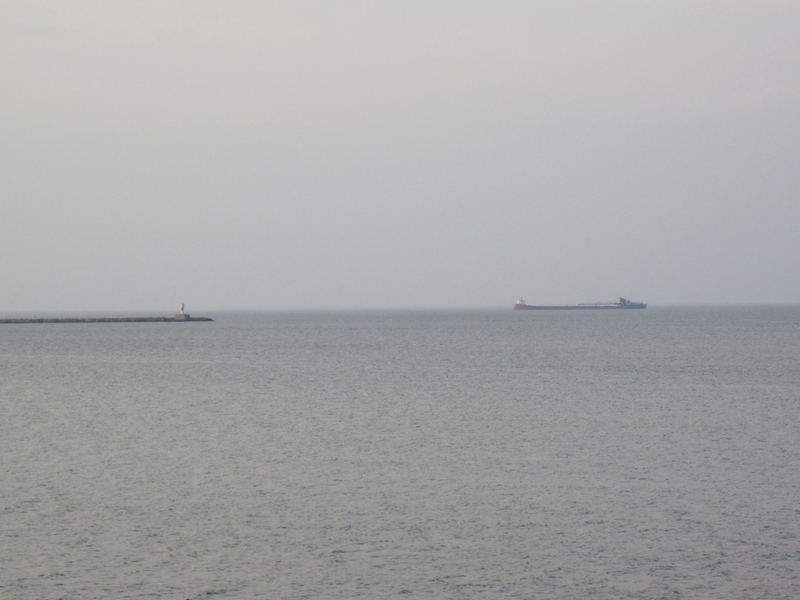 I’ve driven around Lake Superior before, but I haven’t seen the South Shore very much. Only in bits and pieces, and often at night. This year I decided to finally take the time and drive and see the whole thing. And in daylight. 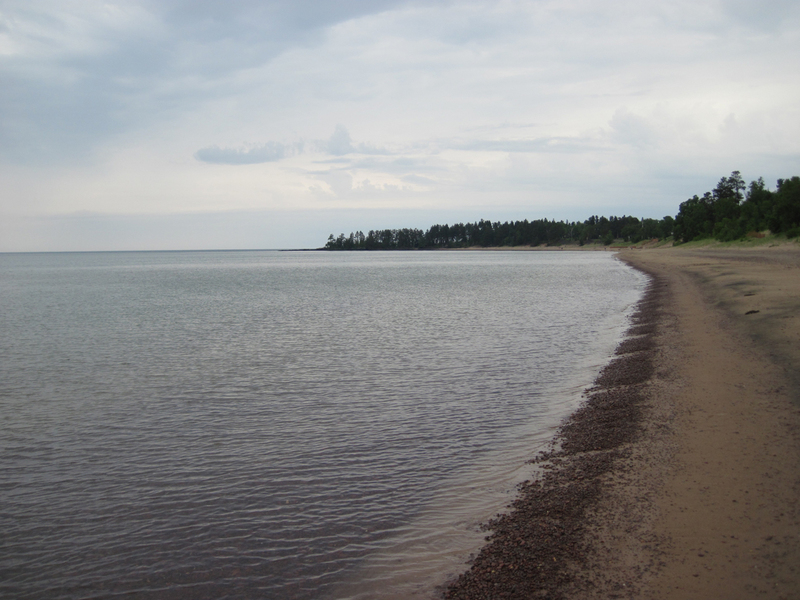 Approaching from the East, here’s the North Shore of Lake Huron, at Blind River. 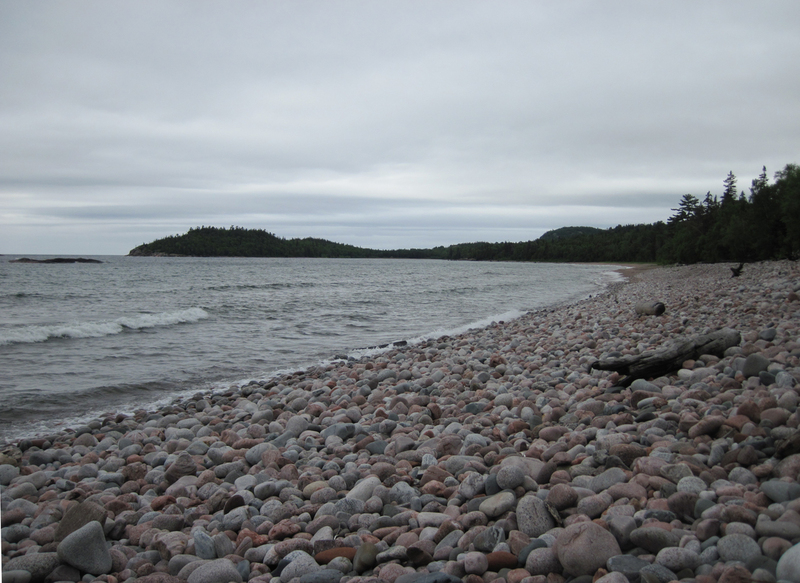 Here’s a glimpse of shoreline in Lake Superior Provincial Park, just North of the Soo. 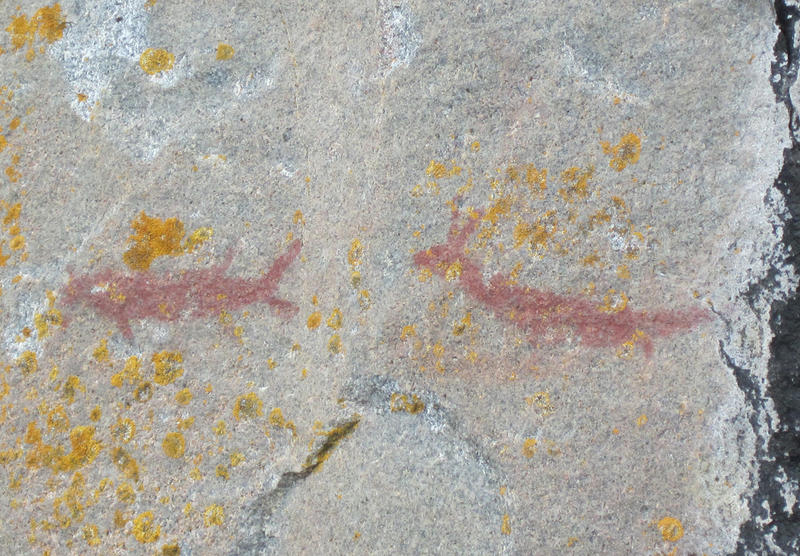 These are Indian pictographs at Agawa Rocks. They’re hundreds of years old, if not a thousand. Those are the only two pictographs I managed to see because they’re located at the base of a slippery cliff, right at the waters’ edge. You have to hold onto chains so you don’t fall in, and it was a bit treacherous that day. Further along in the park is Gargantua Beach. It’s 15 km from the highway, via a twisting gravel road through the bush. There are no cottages or campgrounds here. I had the whole place to myself and experience my “Moment of Zen”. 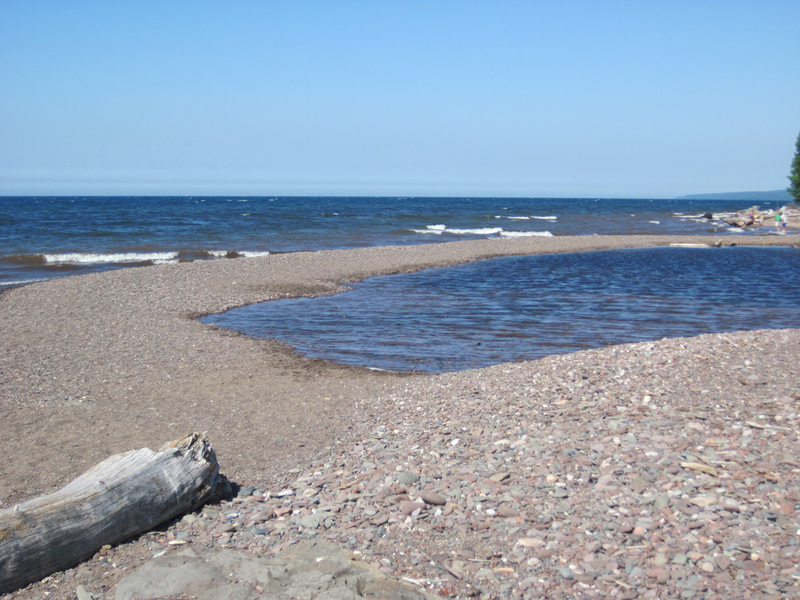 Superior’s shorelines in Ontario are often unspoiled like this. That’s why I keep coming back. 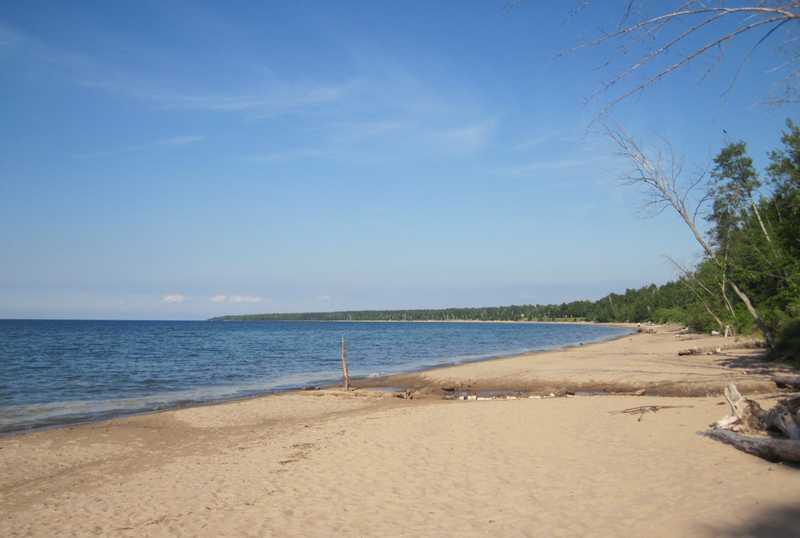 One of my favorite beaches is Sandy Beach, just outside of Wawa. Again, I had the entire place to myself. Even on labor day weekend, you might only see a dozen or so people here. It was too cold to swim at this date in late June. 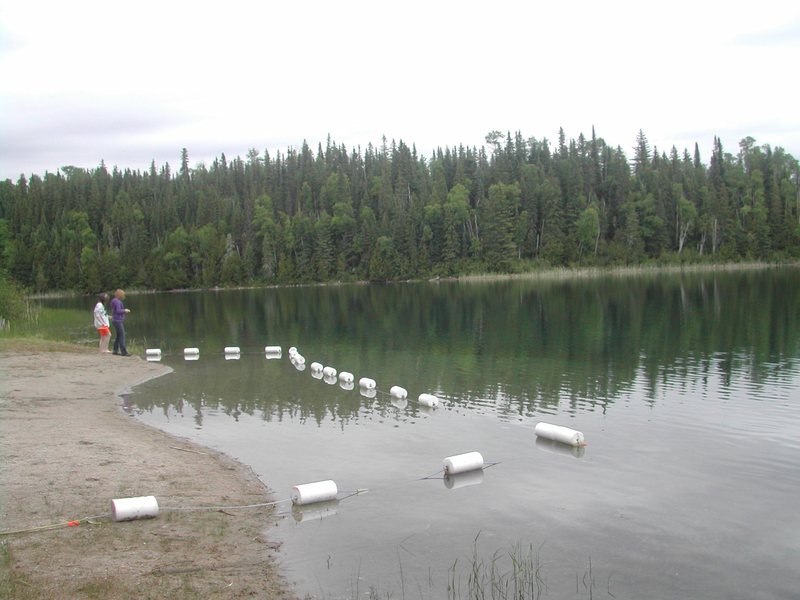 Though the water temp becomes reasonable at the end of August. 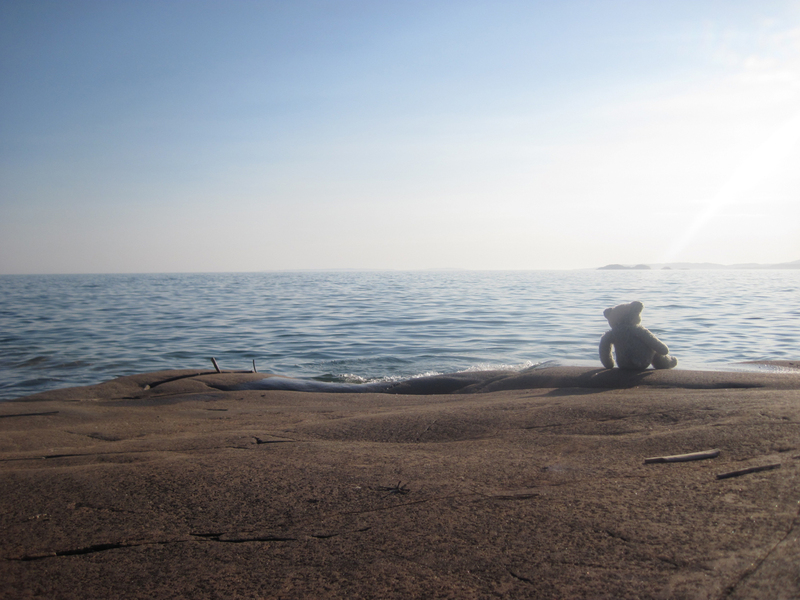 Next, is the Bear having a pensive moment at Neys Provincial Park, near the town of Marathon. In the 1940’s, this place was so remote, they used it as a German POW camp in WWII. I imagine that camp would have been pretty escape-proof camp, back then. With only one train to get in and out, and surrounded by hundreds of miles of bush and black flies. In the 700 km trek between Sault-Ste. 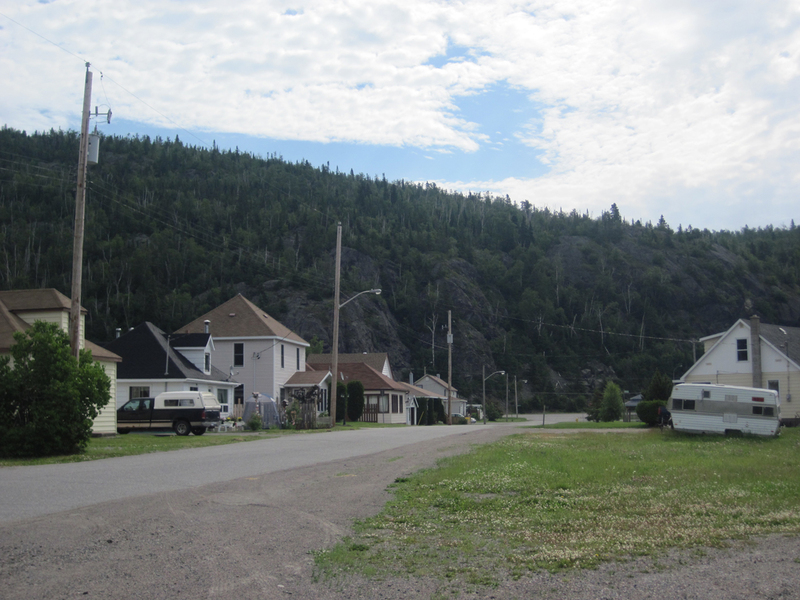 Marie and Thunder Bay, there are about 7 towns/villages of any significance, totalling about 12,000 people. Schreiber is one of them, with a population of 900. It’s basically a railway town. Notice the scrubby black spruce trees everywhere. That’s because this is the boreal forest. It has a very northern feel: you dont’ see any pine trees or maples. The only hardwoods are birch and popular. 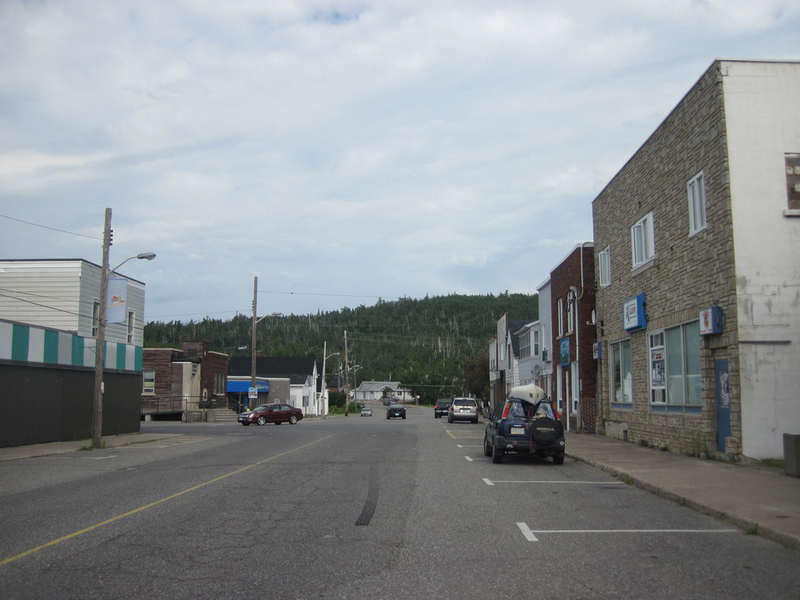 Just a bit further down the road is Rossport. This is more of a village, without even a grocery store or gas station. It appears to have a small artist colony of some sort. 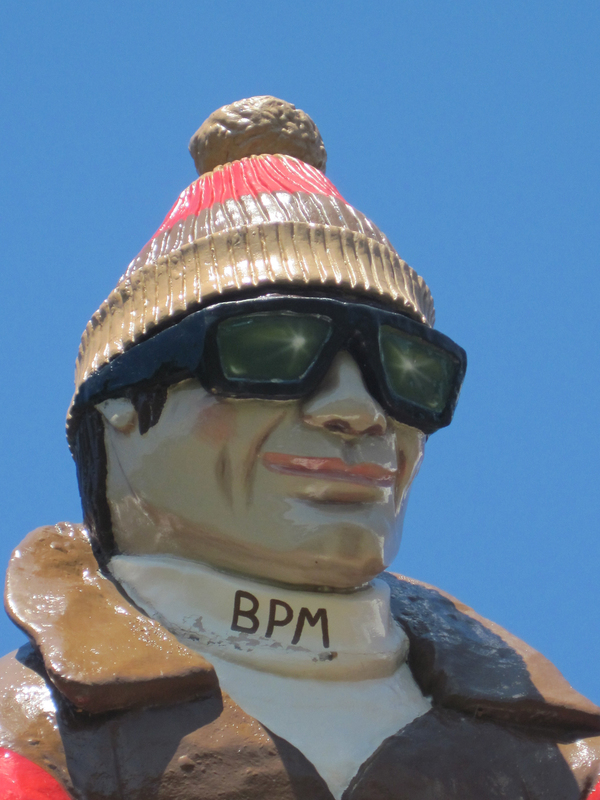 I took a side-trip and went North of Superior to the town of Beardmore. 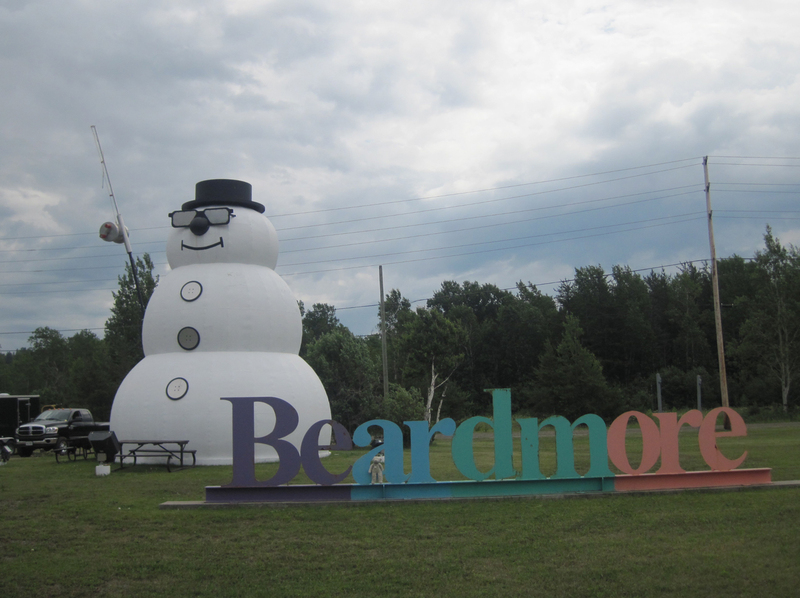 Apparently its claim to fame is a giant 40-foot snowman. Notice the Bear in the “BEAR” part. 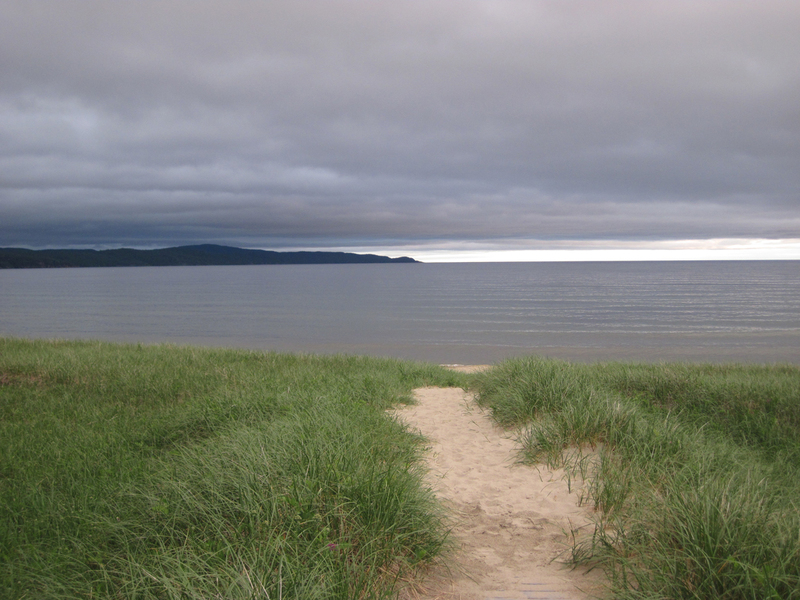 Of course I had to take the detour to see Lake Nipigon, for the first time. This is a pretty serious lake. About 60 km x 100 km, it’s almost like Great Lake itself. 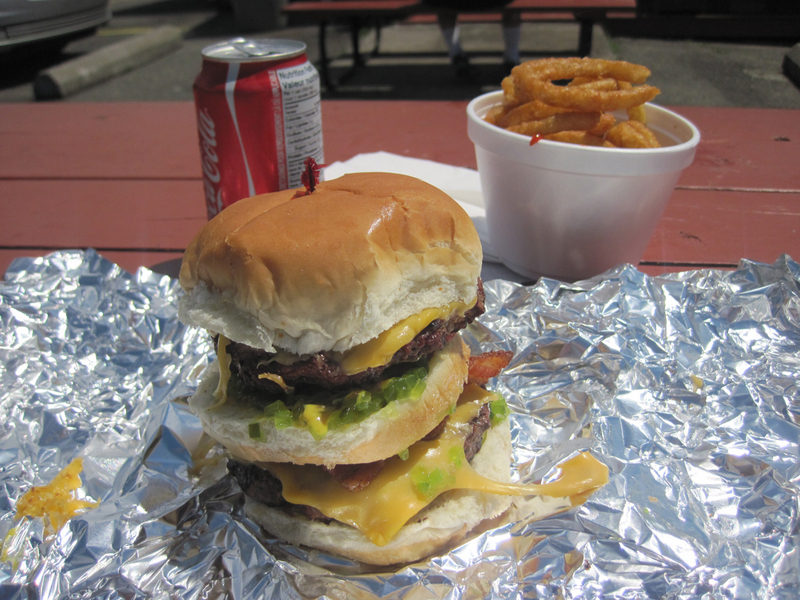 Lunch was a cardiac burger at the Nipigon Drive-In. It was awesome. Too bad it’s a 2-day drive from where I live. Otherwise I’d eat there more often. 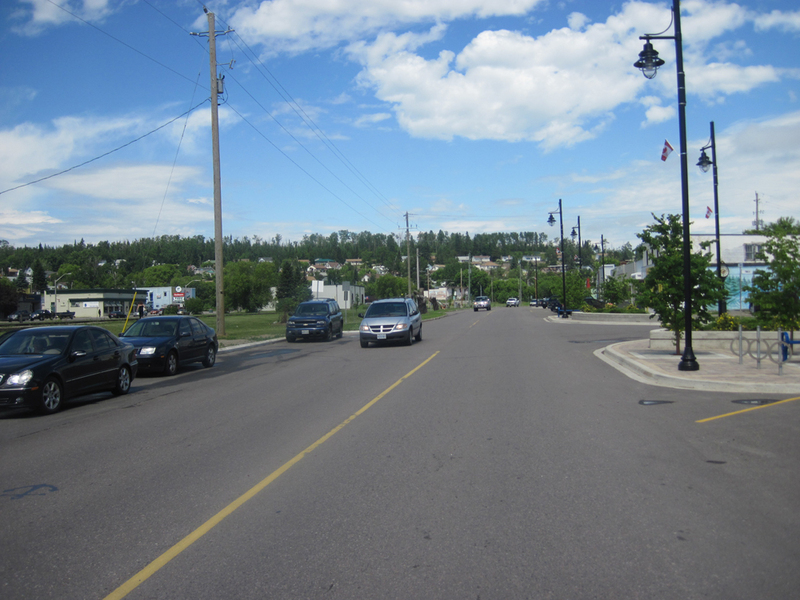 Here’s downtown Nipigon itself, population 1,700. 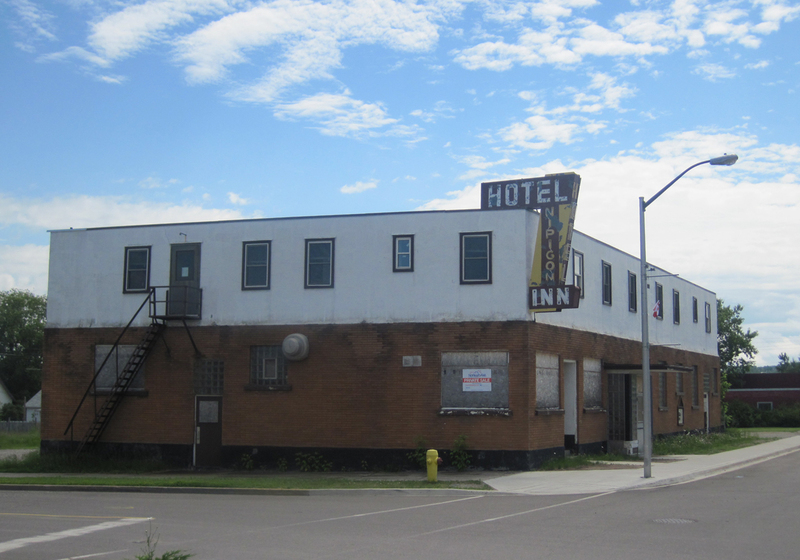 I notice every town in Northern Ontario has an old hotel which is always shut down. Apparently a relic from the older railway days, before mom-and-pop motels took over. Seems downtown hotels just don’t do well anymore in the north. 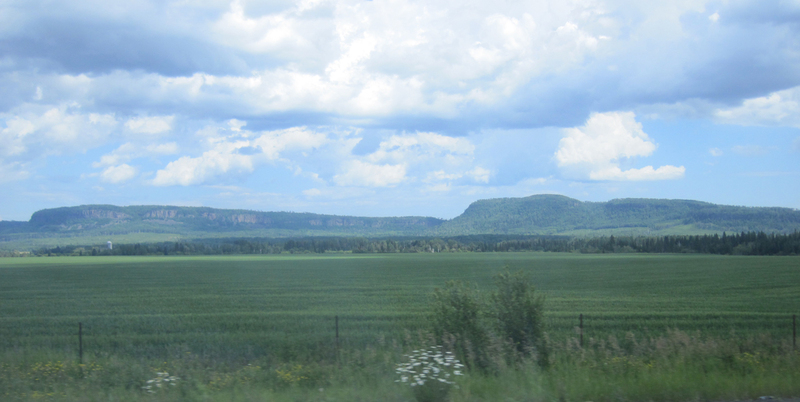 Here’s a scene just outside Thunder Bay. It was rush-hour and there was traffic. I wasn’t in the mood to go see the town itself. 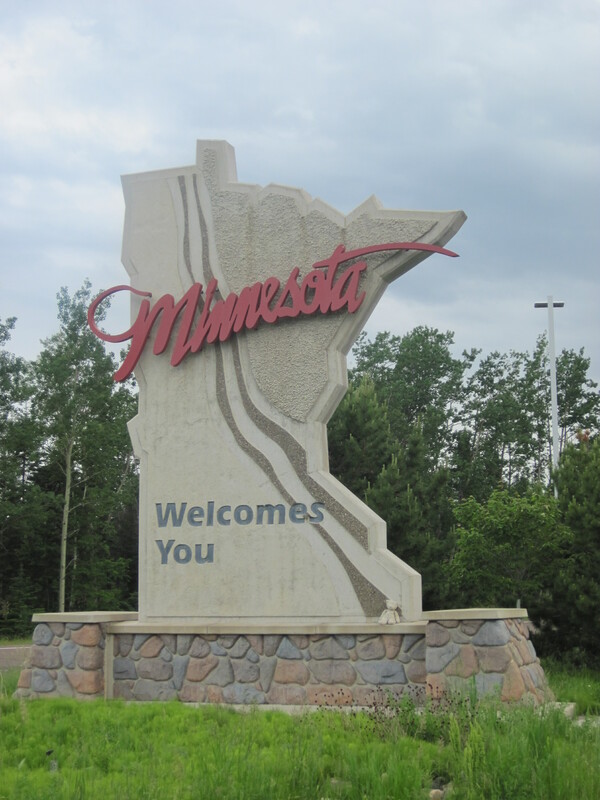 Crossing into Minnesota: I always like road signs shaped like the place they’re in. I found the shoreline in Minnesota disappointing, though. Sure, it’s a beautiful lake. But public parks and beaches were few and far between. 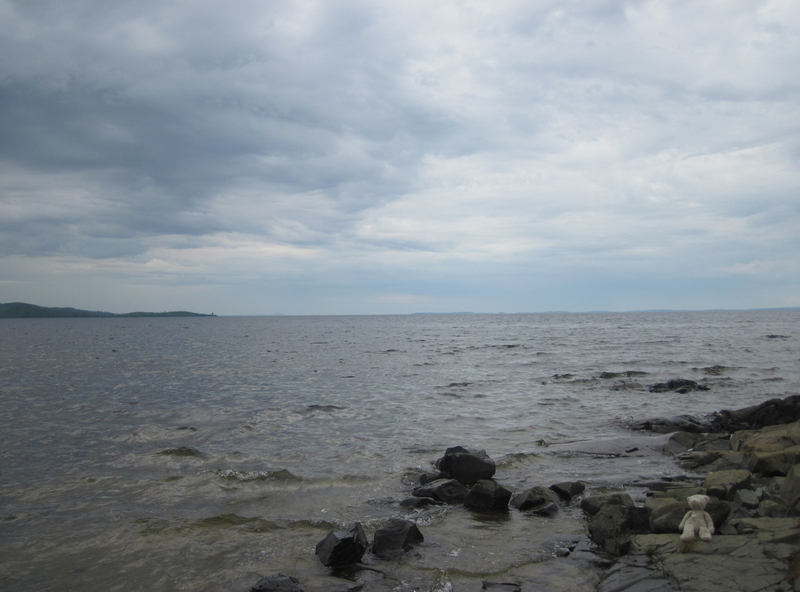 Most of the waterfront was taken up by either private property or by Highway 61. 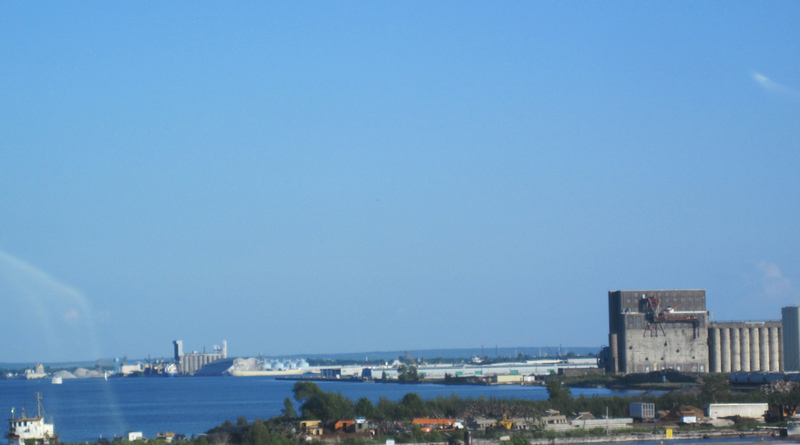 Here’s Duluth, taken from my car. As it was a big city, I was in no mood to stop and kept on driving. This was the furthest point West of my trip. 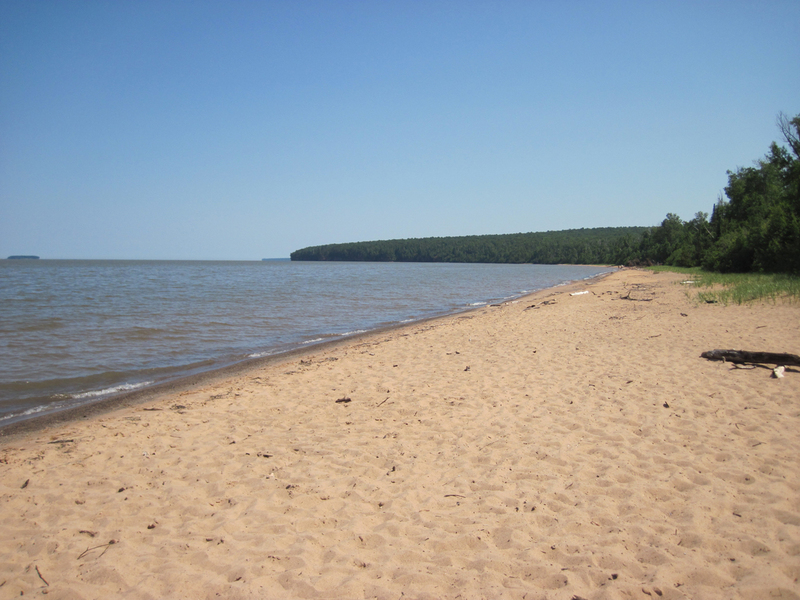 At least we got back to sandy beaches and trees in Wisconsin, near the Apostle Island National Lakeshore. It was quite scenic, but somewhat busy,with sailboats and lots of marinas. 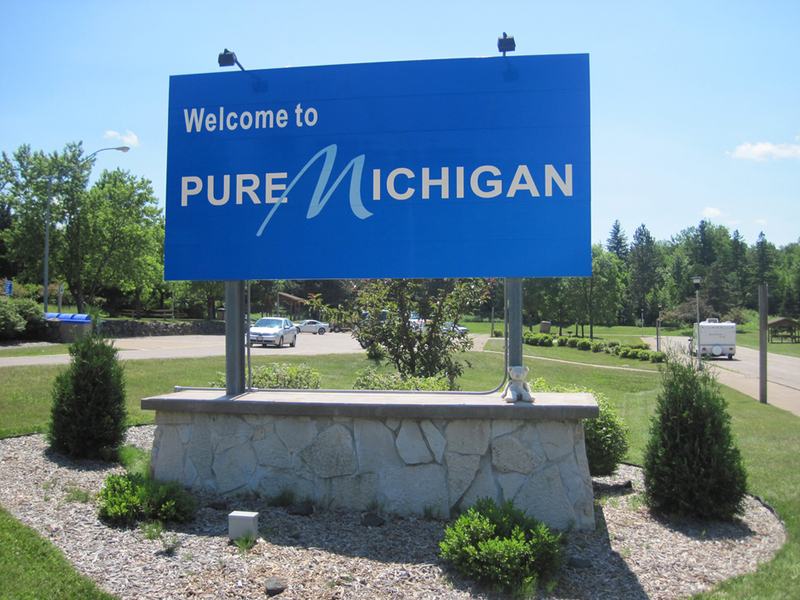 There wasn’t a decent state sign to take a photo of the Bear with in Wisconsin, but at least I got one of him entering Michigan. The first thing I noticed with the Upper Peninsula was the population density. 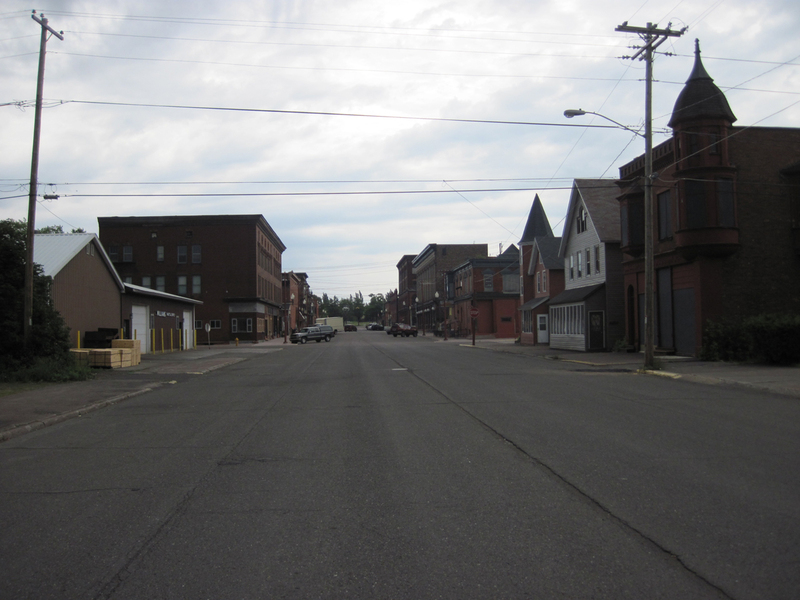 Here’s the town of Ironwood, population ~ 6000. Seems there was one town after another, like this, every 10-20 km. The U.P. 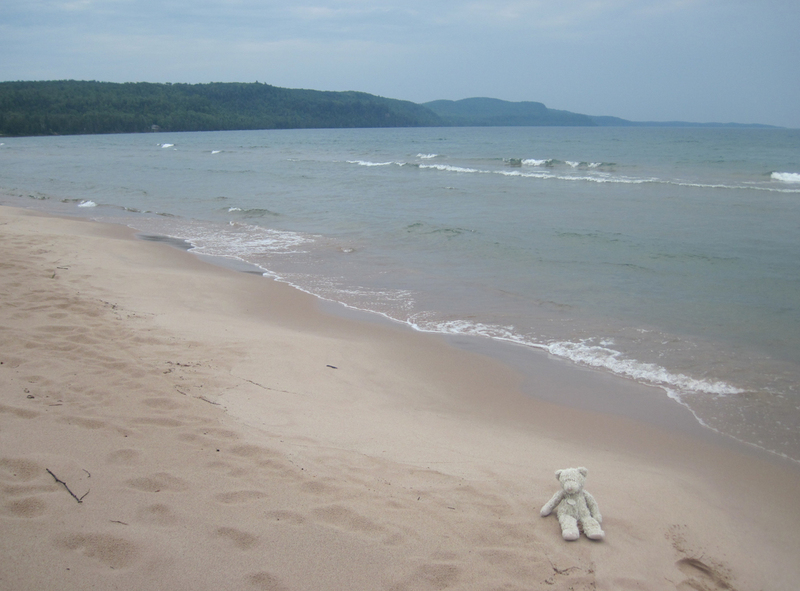 is said to be empty, but I found this part of Lake Superior surprisingly crowded, compared to the Canadian side. Two things fascinate me on my road trips: One is photos of large things. 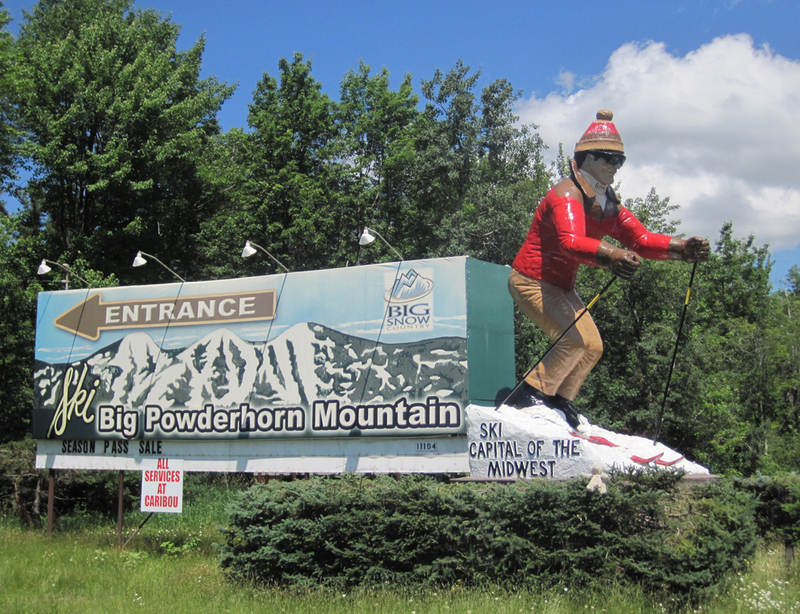 Another is finding ski hills in the middle of nowhere. Here, near the town of Wakefield, I found BOTH. It amazes me that someone went through a lot of trouble to build this. Look at the craftsmanship that went into the skier. A sculpture for the ages, this will be. 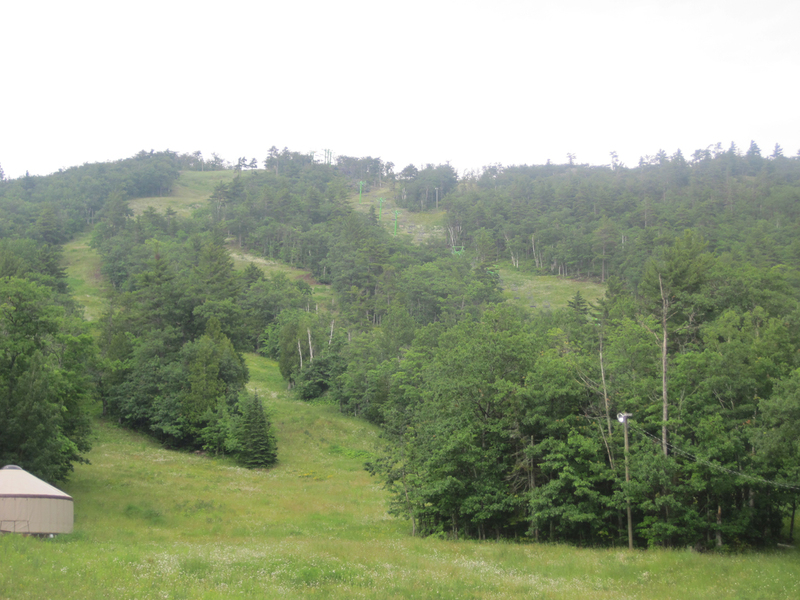 The ski hill itself was interesting. 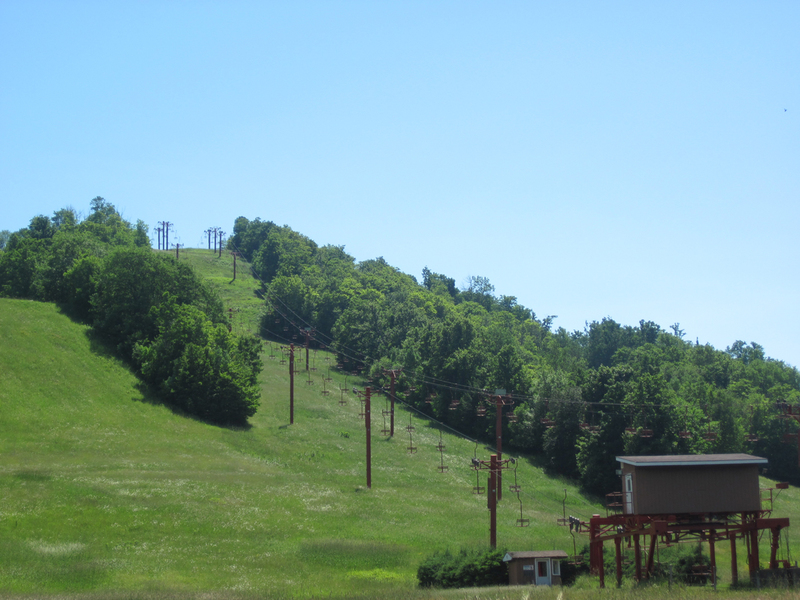 You don’t see too many old metal double-chairlifts like these anymore. They date back 30-40 years. I was pretty impressed with the Porcupine Mountains. 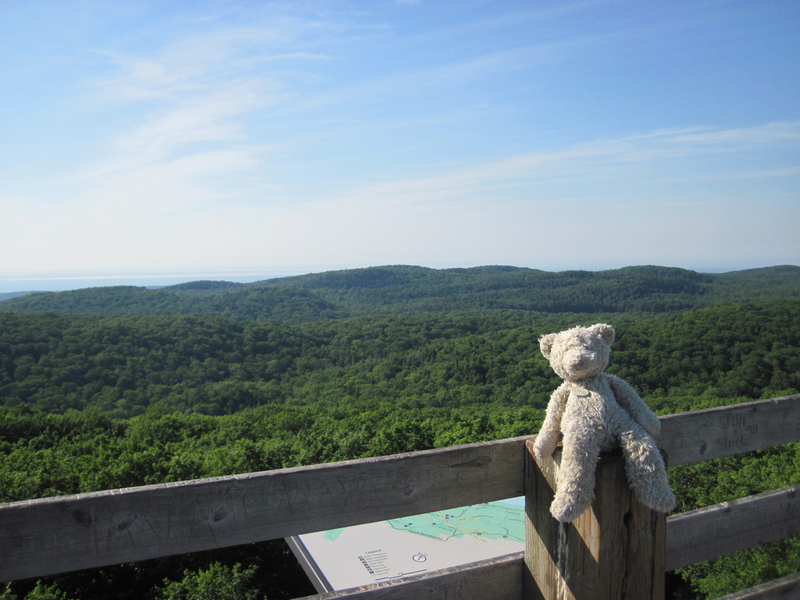 Here is nearly 60,000 acres of virgin forest, one of the largest remaining tracts of old-grown hardwood left in North America. This place is large enough to have wolves and moose. It’s nice to see the state of Michigan had the foresight to preserve this area. I managed to get a swim in there, too. The beach was rocky..but the water temperature was do-able. 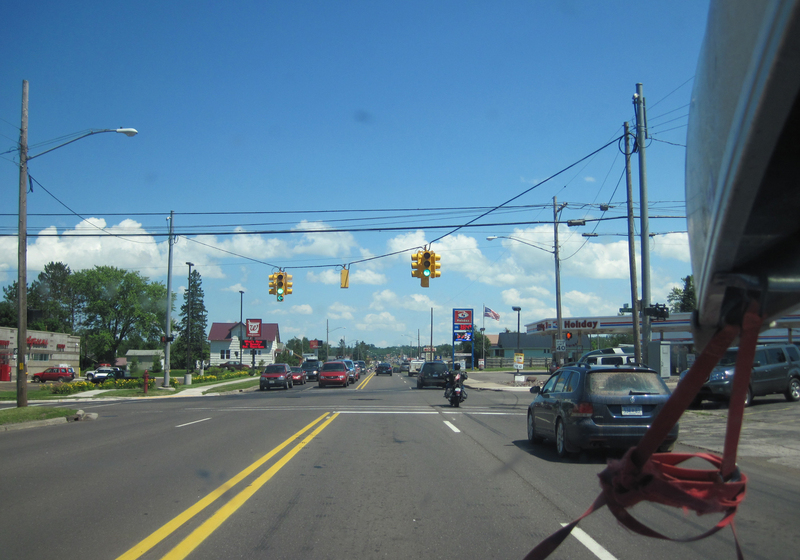 There is s definite southern feel to Superior along this part of the U.P, with the sandy beaches and hardwood trees. The forest is totally different here. 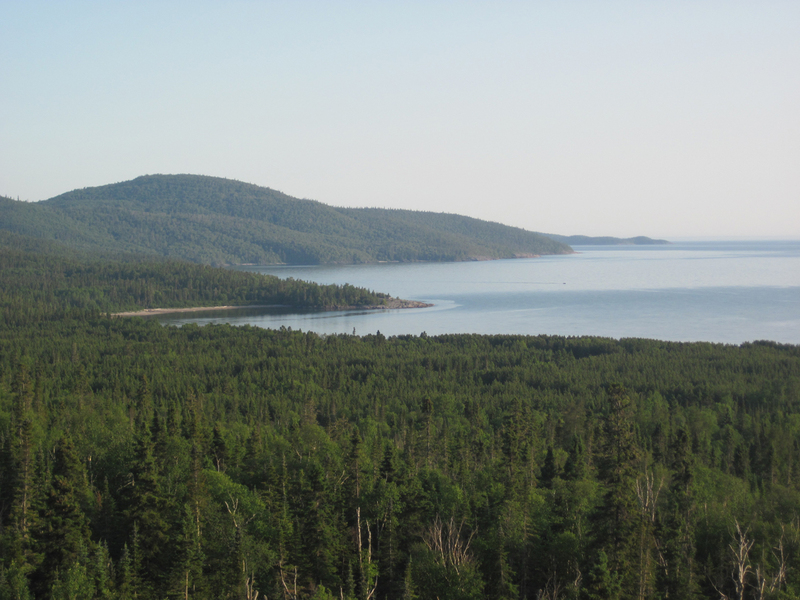 Gone is the boreal forest from the North Shore, and its scraggly black spruce. It’s amazing just 2-3 degrees of latitude can do. 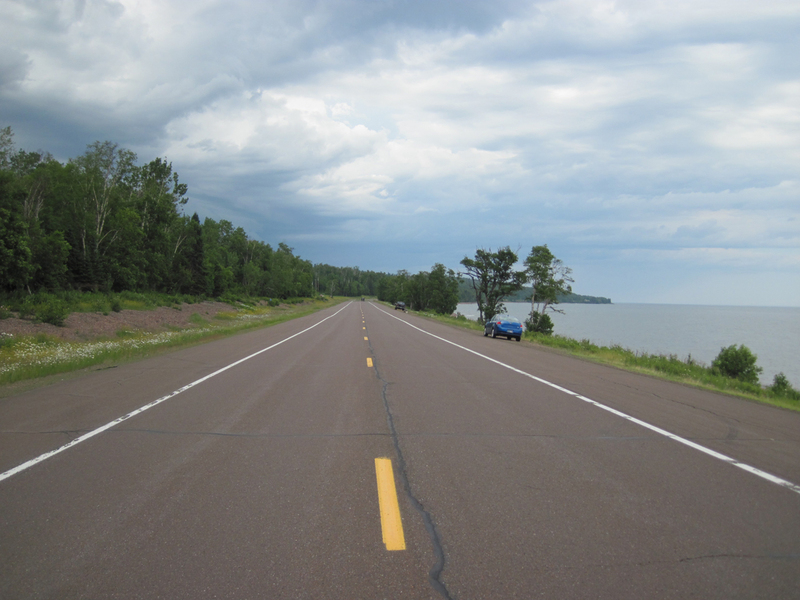 Next on my agenda was to drive up the Keweenaw peninsula, which is a ~100 km long strip of land that juts right out into the middle of the lake. One of the first towns I came across was Houghton and Hancock, across the river. These were surprisingly big towns, with a combined population of ~ 12,000. This alone is more people than the entire population between Sault Ste. 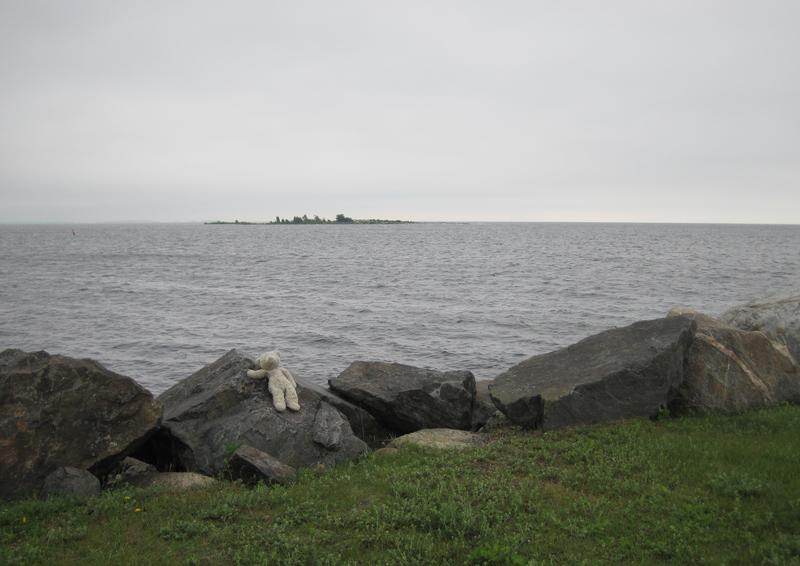 Marie and Thunder Bay on the north shore. 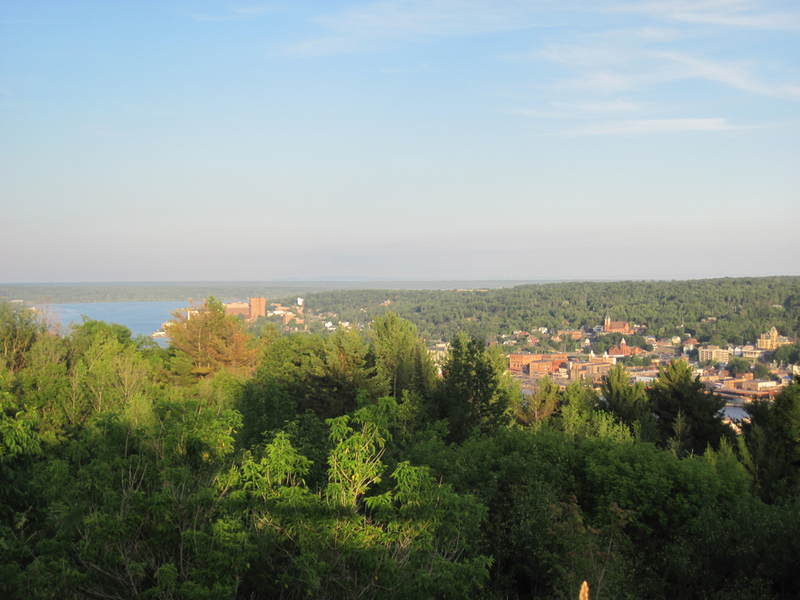 At one time, copper mining was really huge in the Keweenaw peninsula. But the industry peaked decades ago. 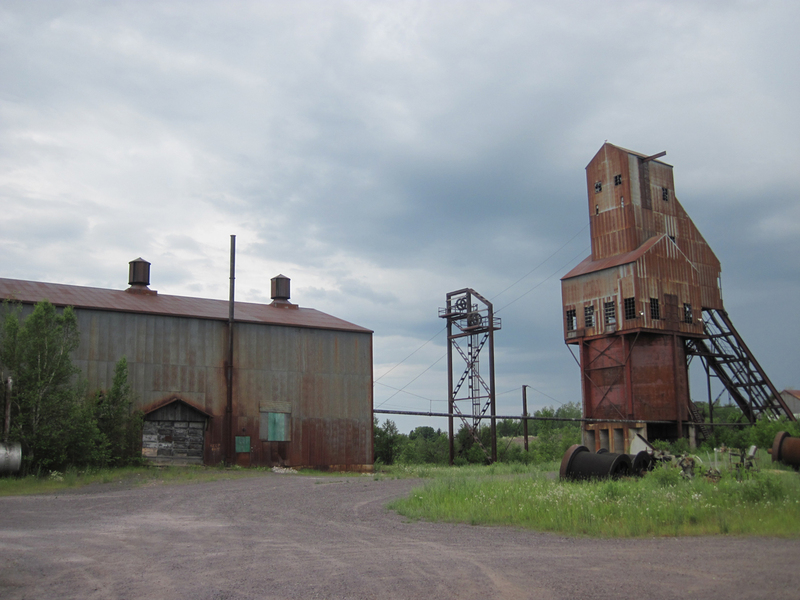 What remains are a lot of ghost-towns and abandoned mines, reminders of boom-years that have long since passed. The economy is definitely not doing well here. I came across one town after another, with closed-down stores and abandoned gas stations. The town of Calumet seemed to be hanging on, though. 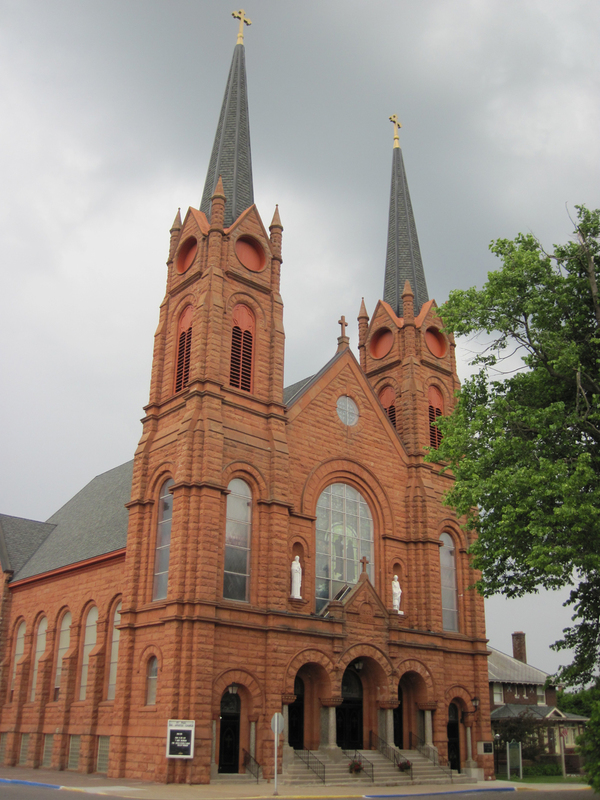 Everything was made of red brick, even the church, which you don’t see too often. Here’s the beach near Eagle Harbor. This was on Saturday, July 9th. Peak tourist season, and the place was absolutely deserted, which I kinda liked. (Though I suspect hotel and restaurant owners didn’t!) The locals assured me that business will pick up in August. 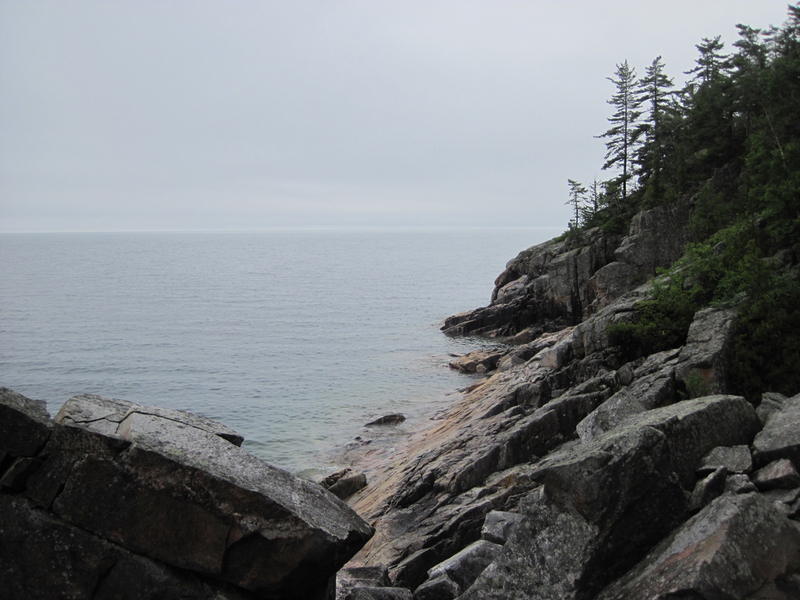 Here’s as close as I go to the tip of the peninsula in Copper Harbor. 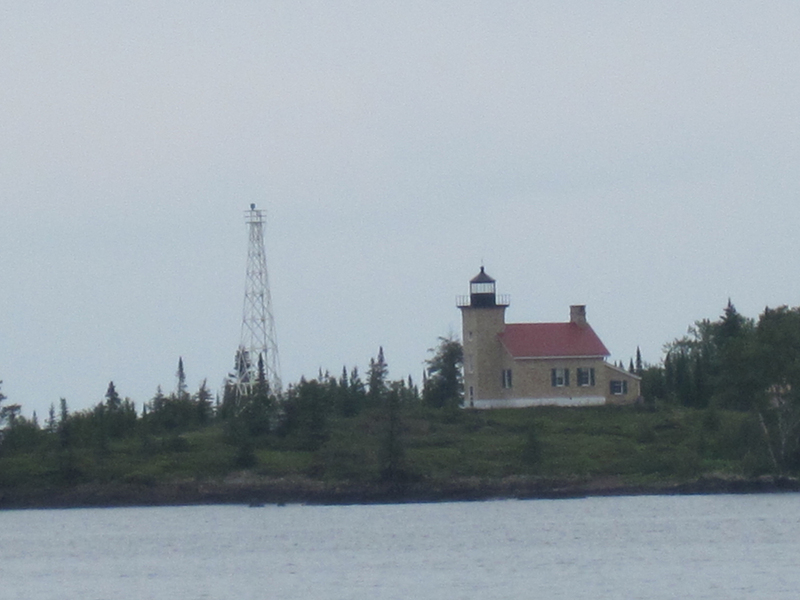 Of course, you had to pay money to enter the State Park to see the lighthouse up close, and I wasn’t going to do that. It was actually downright COLD that day. The local bookstore had the wood stove going. This did NOT feel like July. Heading south again, there was a nice beach at Bete Grise. But again, too cold and damp to swim. Okay…now this is just GAY. 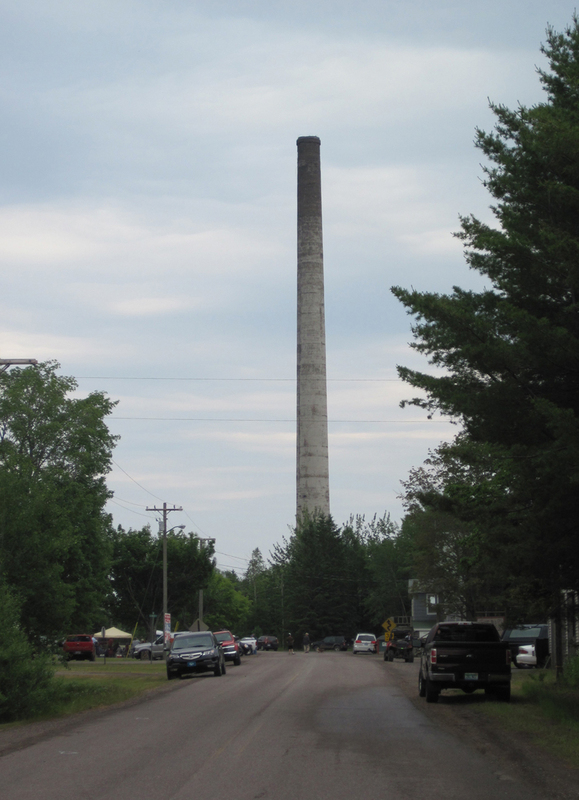 It was strange to see a huge abandoned smoke stack still standing just outside of the town. Probably from an old copper smelter. It didn’t look perfectly vertical. I reckon it’ll probably fall over one of these days. 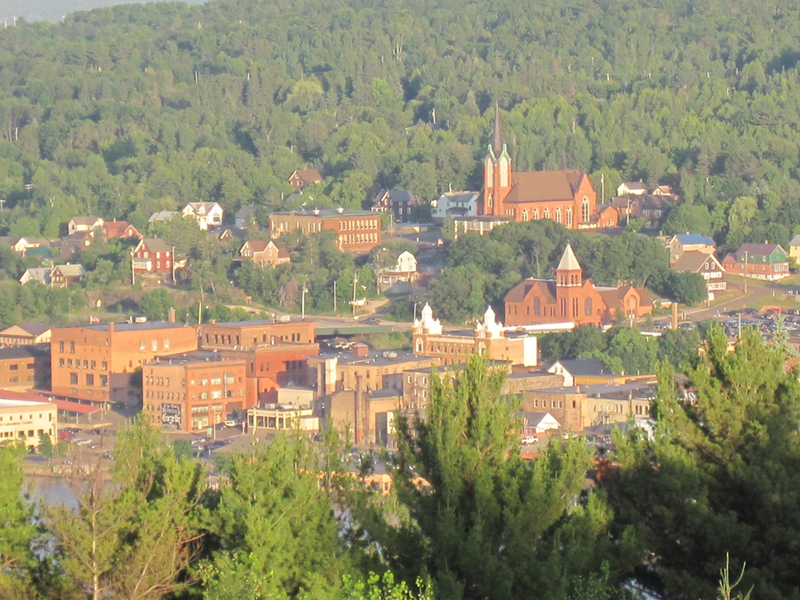 A few hours later, I hit the town of Marquette. 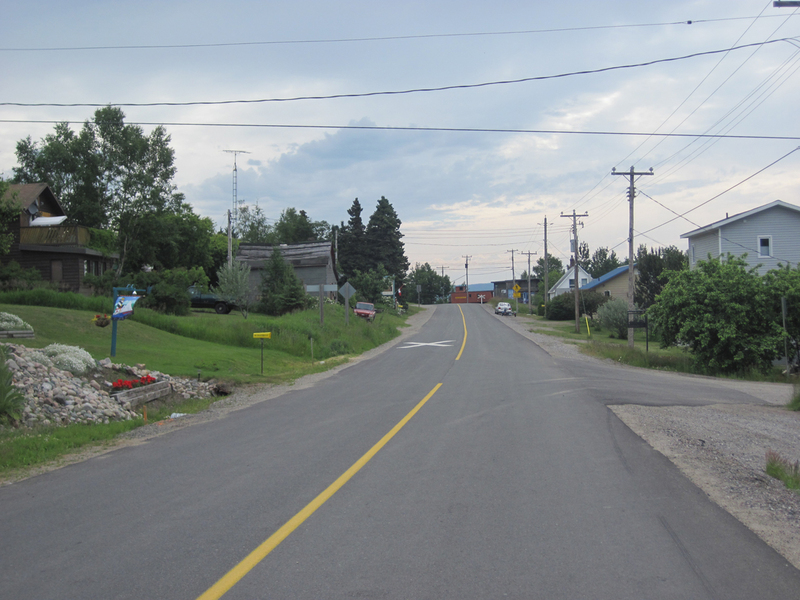 (Another major metropolis, by Norther Ontario standards!) The weather went from cold and damp to stinking hot in only a couple of hours of driving. Summer was back. The next day was a scorcher…hot and humid, and stagnant. The lake was like glass. 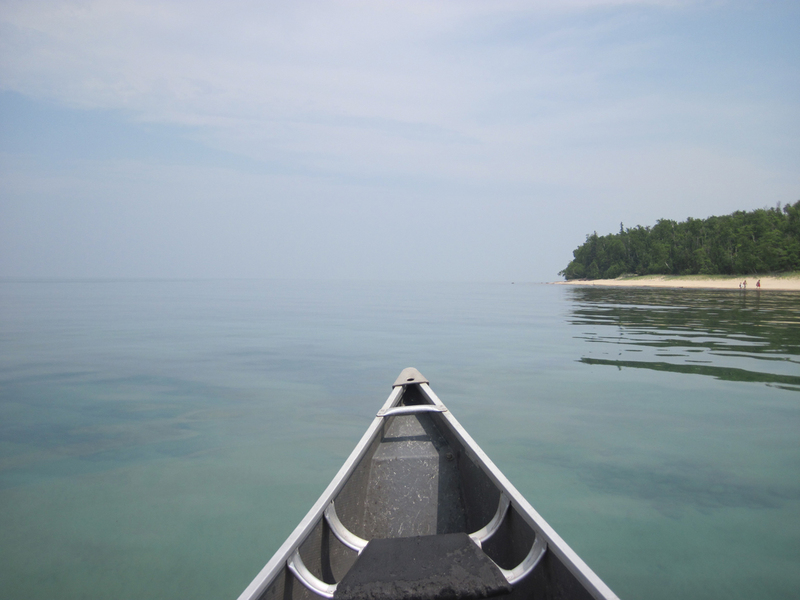 So I put my canoe in it, and I paddled Superior for the first time. This was at a beach along Picture Rocks National Lakeshore, another pristine area that is nicely preserved. 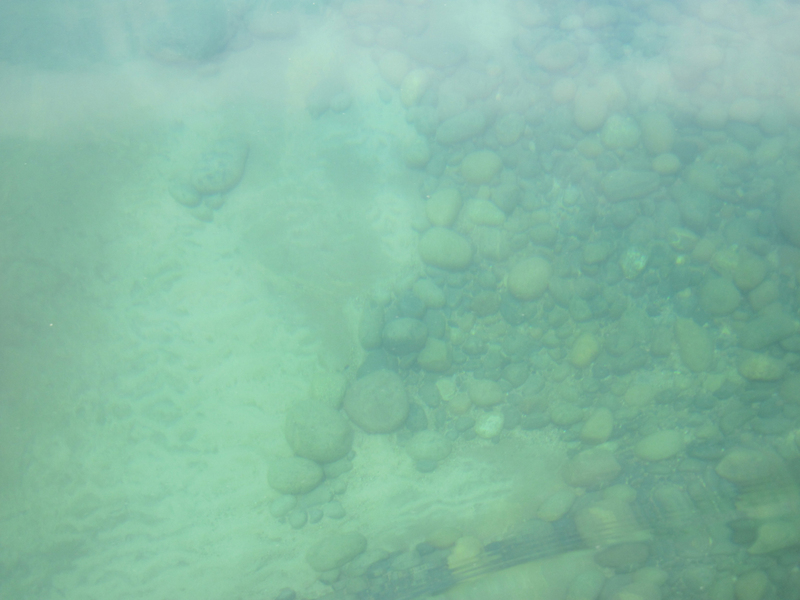 The water was so amazingly clear, you could see all kinds of rocks and fish, right to the bottom. 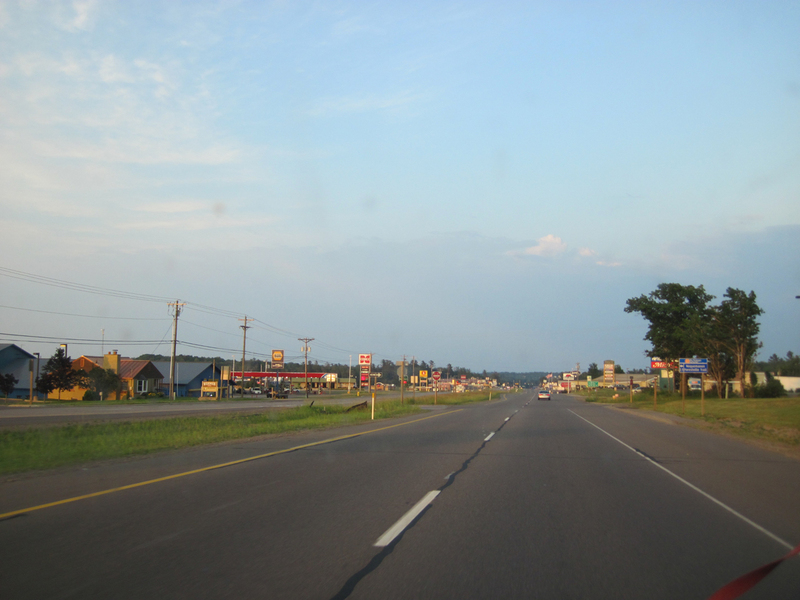 Of course, I could have taken the main highway back to the Soo, but I did one last side-trip, and ended up on some logging road, east of Grand-Marais Michigan. 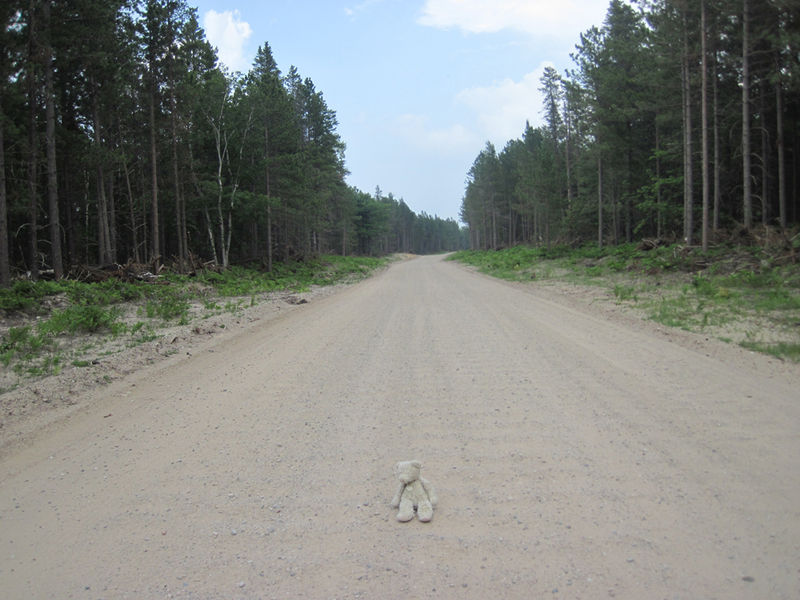 It was one of the few highways I found in Michigan that was unpaved. One last view of the Lake before heading back to the Soo, was at a picnic area off Highway 123, next to Tahquemonon Falls State Park. 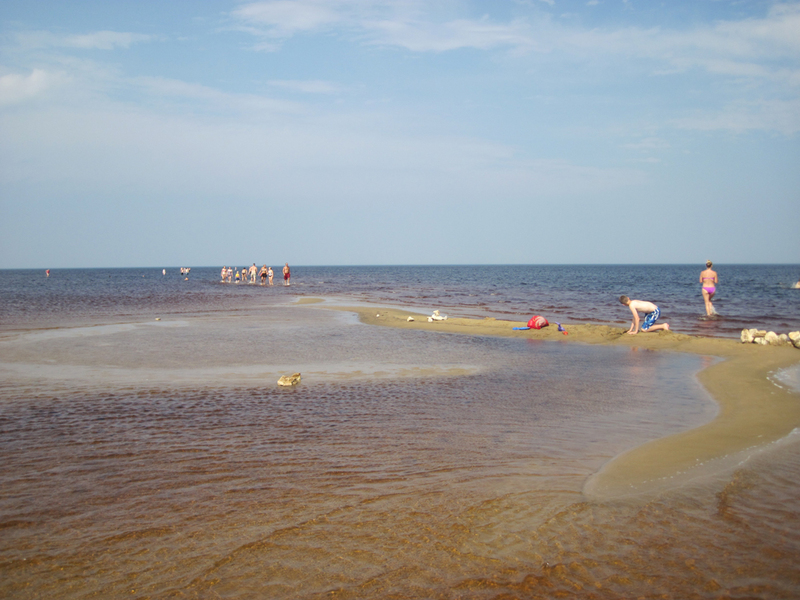 There was a sand-bar and you could wade out hundreds of meters, and only go up to your knees. The water was incredibly warm..the warmest I’d ever seen the lake. 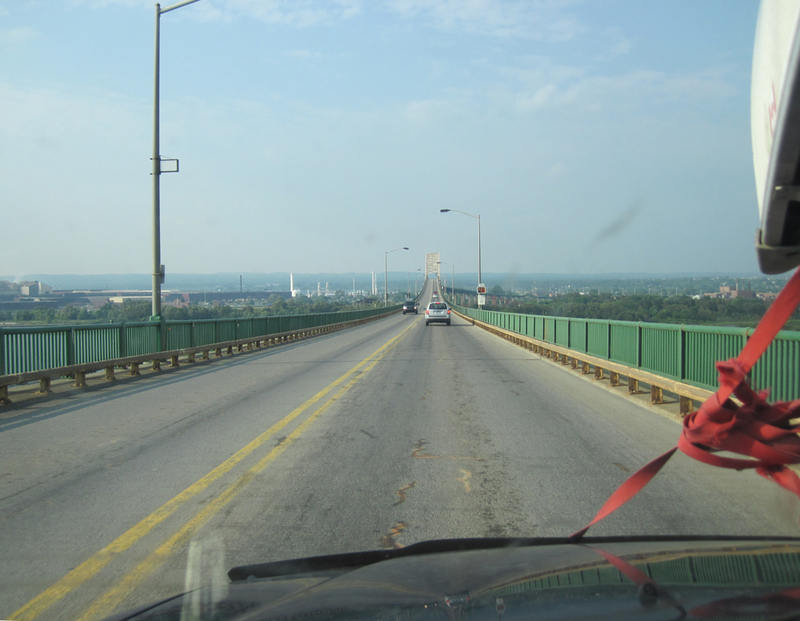 Finally, I was back at the Soo, crossing over to the Canadian side. I considered that end of my road-trip. Home was still hundreds of km away. But as far as I was concerned, the best part was already over. You are currently browsing the The Deep Friar weblog archives for July 2011.